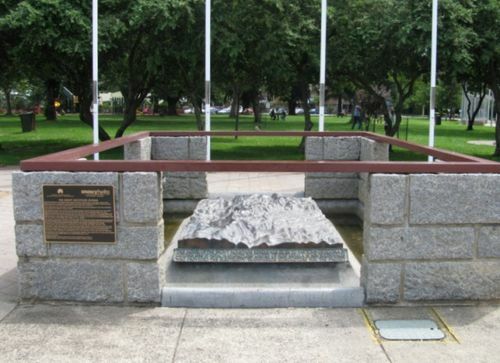 A monument commemorates the construction of the Snowy Mountains Hydro Electric Scheme. Between 1949, when the first blasting shot was fired, and by 1974, when the physical works of the Scheme were completed, over 100,000 men and women from more than 30 countries had worked on the Scheme. Australians formed the largest nationality group on the Scheme, making up one-third of the workforce, which reached a peak of 7300 in 1959. Many migrants were escaping the horror of war-torn Europe to begin a new life in a new land. Working together on the Scheme, they became part of the Snowy family with former enemies and allies working side by side. The Snowy Mountains Scheme – tough and unremitting as the work was – provided their introduction to Australian working life and it stands as a monument to their endeavour. During construction, seven regional townships and over 100 temporary camps were established throughout the Snowy Mountains. These towns and camps serviced the men, women and families who came to build the Scheme. Life in the camps was extremely hard, especially during the early years, when hundreds of men spent harsh winters in canvas tents with only basic amenities and provisions. In 1974 when construction on the Scheme was finished, many of the workers dispersed to new jobs in Australia and overseas. But by far a majority of those who came to build the Scheme and a new life stayed, becoming Australian citizens. These new Australians with their energy and enterprise would change Australia’s social and cultural skyline forever. The Snowy Mountains Scheme is not just a great feat of engineering; it is also a great social achievement with its multi-national workforce contributing to the cultural mix we enjoy today. It has also made a significant contribution to the economic development of modern Australia. Note : This memorial originally contained plaques dedicated to workers who lost their lives in the construction of the Snowy Mountains Scheme. These plaques have been relocated to the Snowy Hydro Education & Information Centre in Yulin Street and now form a separate memorial. CONSTRUCTION OF THE SNOWY MOUNTAINS SCHEME COMMENCED IN OCTOBER 1949 AT THE ORIGINAL SITE OF ADAMINABY. FOR ALMOST 53 YEARS, THE SCHEME WAS BUILT, OPERATED AND MAINTAINED BY THE SNOWY MOUNTAINS HYDRO-ELECTRIC AUTHORITY. ON 28 JUNE 2002 THE AUTHORITY WAS CORPORATED AND RESPONSIBILITY FOR THIS NATIONAL ICON PASSED TO SNOWY HYDRO LIMITED. THE PROUD HISTORY AND SPECIAL VALUES ESTABLISHED DURING THE BUILDING OF THE SNOWY MOUNTAINS SCHEME LIVE ON IN SNOWY HYDRO LIMITED. THIS IS DEMONSTRATED BY THE INNOVATIVE PRODUCTS SUPPLIED TO THE NATIONAL ELECTRICITY MARKET, THE ACHIEVEMENT OF WORLD`S BEST PRACTICE IN MAINTENANCE AND OPERATION OF ELECTRICITY GENERATION PLANT AND HYDRAULIC FACILITIES, AND IN THE PRIORITY OF THE CARE OF THE ENVIRONMENT AND TO THE SAFETY OF THE MEN AND WOMEN OF "THE SNOWY." THE SNOWY MOUNTAINS SCHEME IS RECOGNISED AS ONE OF THE SEVEN ENGINEERING WONDERS OF THE MODERN WORLD. IT IS ALSO RECOGNISED AS THE BIRTHPLACE OF MULTICULTURALISM IN AUSTRALIA. OVER 60,000 PEOPLE FROM OVER 30 COUNTRIES, TOGETHER WITH OVER 40,000 AUSTRALIANS, PARTICIPATED IN CONSTRUCTING THE SCHEME BETWEEN 1949 AND 1974. THE SNOWY MOUNTAINS SCHEME PROVIDES RENEWABLE ENERGY AND RELATED PRODUCTS AND SERVICES, WATER FOR IRRIGATION AND FOR FOOD PRODUCTION IN SOUTH EASTERN AUSTRALIA WHILE CONTRIBUTING TO THE CARE AND MAINTENANCE OF ITS AREAS IN THE KOSCIUSZKO NATIONAL PARK, WORKING IN PARTNERSHIP WITH THE NATIONAL PARKS AND WILDLIFE SERVICE. IN ADDITION, THE SCHEME OUTPUT OF RENEWABLE ENERGY DISPLACES UP TO 4.5 MILLION TONNES OF GREENHOUSE GASES FROM THE ATMOSPHERE EACH YEAR.